EDEN hairdressers MONIQUE and KELLY have got their hands and feet so entangled, they spent the whole night trying to break free. NO point hiring these two, EDEN hairdressers TESSA and MONIQUE to direct the traffic at a busy junction on M25. School Dinners London's FUN Christmas party venue. Young and old, they all like to give me a cuddle, but nobody does it like our Eten boy S. What a pity that our headmaster, Mr Tuckman, put him in detention afterwards. With Santa next to me and a lovely angel, who could ask for more? 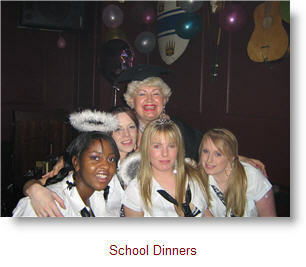 School Dinners for a FUN birthday party. Birthday girl NIKKY’s best friends KAREN and LYNN who helped take photos for me. 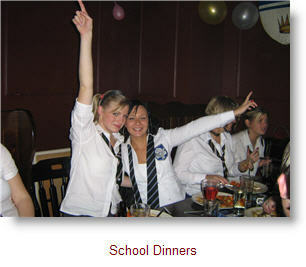 School Dinners for FUN birthday parties.